Now that the cabinet is complete, I finally get to actually use it and play some games. I thought I might review some games on there, and possibly for other games I have on other game systems. For my first review I picked a game that caught my eye while I was wading through my list of arcade games. Part of the fun of finishing an arcade is getting to go through and test to make sure all the games work. This would only be hard work for someone who doesn't like games. Luckily for me, I love playing old arcade games. Luckily for you (or maybe unfortunately for you? ), I'm also nerdy enough to love reviewing them. Pretty much everyone has heard of Sonic the Hedgehog. It was a staple of any kids video game collection in the 90's. But, not everyone has heard of SegaSonic the Hedgehog. It was released in Japan in 1993 and had a limited release in the UK, and some other English speaking countries. Released in between Sonic 2 and Sonic 3, the game stars Sonic the Hedgehog along with Mighty the Armadillo, and Ray the Squirrel. You may never have heard of the other two characters, and you are not alone. Ray would only return to the Sonic world in Knuckles Chaotix, and Ray has not returned to any Sonic game as of 2012. The game is different than the typical Sonic games most of us know, in that the player(s) control Sonic, Ray, or Mighty with a trackball and one button. This type of interface for the Sonic games is unique, and I find that it fits the Sonic brand perfectly. Why wouldn't you want to control Sonic (who spends half his blazing fast runs in ball form) with a ball, unless you just hate the trackball interface for games, then I could see this not making sense to you. 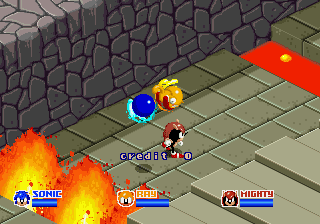 The game is displayed in a top down isometric format where you can move sonic and his cohorts in a pseudo 3D plain in all directions with the trackball. This view format would not be revisited until Sonic 3D blast, which came out on the Sega Genesis 3 years later, and the trackball interface has not been revisited since. The trackball is used to guide sonic and his friends throughout the levels, and the one button will allow your character to jump; precise timing is needed to pull of some of the quick gaps that come up in your way. Moving the trackball left will move your character left, and moving the trackball right will move your character to the right, and the rest is true for all the other directions. Most of the levels are laid out so that a diagonal motion with the trackball is needed to allow your character to go in the correct direction of the track. I do not know why the designers chose this, as I felt it was more difficult to keep rolling the trackball at an angle rather than vertically or horizontally. The basic premise of the game is that Doctor Robotnik has captured your character. 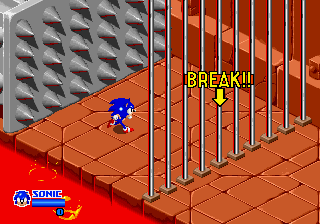 After breaking out of your cell, you are then rocketed out of Robotnik's lair by him. Why he captures you just to shoot you around the island, I still don't know. Of course all the dialog is in Kanji (Japanese lettering) so I am just going off of the animation, and the few words that are in English. All the levels start with Dr. Robotnik initializing some type of hazard that slowly creeps up on you as you run to the end of the level. This is incentive for you to move fast, or as I like to call it, the "motivational" hazard. However, this does help to keep the pace of the game moving along quickly. You then need to guide Sonic along the level, which can change direction from time to time, but there is no time limit, except for the "motivational" hazard that will kill your character should you move too slow. I found these hazard to increase and decrease in speed when I would run faster or slower, but they would eventually catch up to me if I was too slow, or would stop completely. There are additional hazard that will come from below, above, and from the sides of the course. Within each level are rings that you can get, although I found this hard as they pop up quickly, and if you do not already know the level layout you will have to hit the brakes and turn around to grab them. Once you reach the end of the level you will be given a percentage total of how many rings you have collected. If you collect enough, over the 50% level, you will be given a ring bonus, which entails more points, yay! These points, of course, increase your score, which is something all arcade players are a slave to. All in all I like the level design. Each level features different obstacles and hazards to avoid, and the course changes up enough on its direction that they do not feel stale after a few levels. It keeps you on your toes, and has you smacking the trackball as quickly as possible to beat your "motivational" hazard from behind you, as well as keeping your finger on the jump button in case anything should pop up, or fall beneath you. The graphics for this game are great, especially considering the game was released in 1993. Sonic and his pals look very good, maybe the best I have seen in this perspective. As stated earlier the only other Sonic game I can think of where we have this view field for him is Sonic 3D blast, and this topples those graphics in comparison. Although to be fair, Sonic 3D blast was running on Sega Genesis/Mega Drive hardware, and this arcade was running on the Sega System 32 hardware, which is a much more powerful system than the home console. There was a release of Sonic 3D Blast on the Sega Saturn with improved graphics, and I still think that these arcade graphics top the Saturn version on 3D blast. All the animations when the characters are jumping look very fluid as well as when they pick up speed and start to run very fast. All the levels are varied with great depth perspective. Whether you have Sonic running along the high walls of a volcano or swimming beneath the river from a mountain, the perspectives are all great. The difficulty of this game is pretty high, as should be expected with most arcade games. If you are unfamiliar with the level design be prepared to fall and die a lot. Having said that, it is still a fun game, and even better the second and third time around. The fast paced game play will keep you moving and trying to hit all the lines of rings that you can. The developers at least gave some slack and decided to give a warning when your character is getting too close to the edge. If you run up to an edge Sonic will start to wobble and then fall after a few seconds. 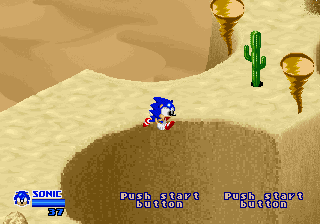 If you are quick enough you can spin the trackball in the opposite direction and Sonic will run away from the cliff...of course, this doesn't help with the "motivational" hazard coming from behind. It can make for some intense moments when you're trying to race Sonic through the course. 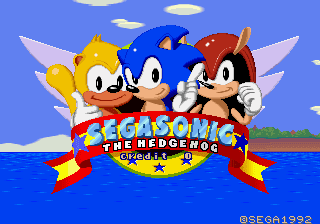 SegaSonic the Hedgehog is a unique game in the Sonic the Hedgehog series. It has a fun control mechanic that works well with the franchise, and also keeps the fast pace arcade fun that it is going for. The graphics still hold up after all the years and the pick up and play availability of the game compliments it's aggressive difficulty level. If you have a chance to play this game do not miss out. It is tons of fun, sadly the only way you may get to play it would be in a MAME cabinet. Not many arcades of this are around, and most of re-purposed. The MAME experience is still great though, so if you have a chance go for it! What's your favorite Sonic the Hedgehog game? Thanks for tuning in!